Note: Confused by the new look? Check out the intro here. Beckett was once again brilliant: 7 IP, 4 H, 0 R, 2 B, 4 K, 9/3 GO/AO, 107 pitches, 69 strikes. He lowered his ERA to a team-leading 2.11. He should be Minnesota-bound in a couple weeks. …oh, my. He’s right, isn’t he? 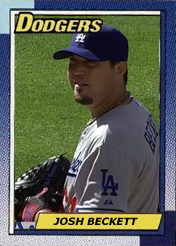 Josh Beckett, seemingly unwanted throw-in to the Adrian Gonzalez trade, is really going to make the All-Star team, isn’t he? Now, you know that I don’t usually care about the All-Star selections, and I especially dislike that it counts towards anything. If the fans want to honor Derek Jeter one last time before he goes, that’s absolutely how it should be, but no one would argue that Jeter is the best shortstop the American League could field in a game they’re trying to win. So usually I ignore the whole thing, except for the fact that Beckett, 34 years old, and coming off both major surgery and two terrible seasons in his last four, could actually make it — despite pretty much all of us agreeing that he’s the fourth-best Dodger starter. So a situation like that demands that I look into it. Is this really possible? As usual, this requires us to understand the difference between “should” and “could.” It’s true that Beckett has the fourth-best ERA in baseball right now, behind only Johnny Cueto, Adam Wainwright, and Masahiro Tanaka. But, as I hardly need to tell you, ERA doesn’t make the pitcher, and it’s not a coincidence that he doesn’t stand up to the other guys in the top five, including Felix Hernandez, in any other way. None of them have a FIP above 2.91 — Hernandez’ is 1.95! — while Beckett’s is 3.77. They’ve all been worth at least 2.6 WAR. Beckett is at 0.8. Now my goal here isn’t really to tear Beckett down, because he’s been a revelation, using his curveball to offset a declining fastball, and he’s been better than anyone could have possibly hoped. He very well may be the NL Comeback Player of the Year. But still, an All-Star? Really? Let’s investigate. There’s usually 13 pitchers on an All-Star team, and that usually turns into 15 or so due to guys nursing injuries or who pitch on the final day before the break and won’t be available. Last year, 10 of the NL pitchers were starters. The year before, eight. In 2011, nine. So let’s say nine, for now, and there’s three obvious, no-doubt locks among NL starting pitchers: Cueto, Wainwright, and Stephen Strasburg. I’m going to throw Clayton Kershaw in there as well; the only thing holding him back from the leaderboards is a lack of innings pitched, which will be resolved in a week or two, and the no-hitter and trophy case resume should make it an easy call for NL manager Mike Matheny to want him on the team. Jeff Samardzija is absolutely worthy as well, and we’ll tentatively include him, pending the possibility of a trade that would send him out of the National League first. That’s five, but remember, you get into roster games with the “every team must have a representative” rule, and with Yasiel Puig likely a starter and Dee Gordon, Hanley Ramirez and Zack Greinke possible additions as well, the Dodgers may not be able to send five or six guys. But even if Beckett somehow does beat out Greinke, will Matheny prefer him to Tim Hudson in terms of older former stars who have had great seasons? Is a 2-4 record enough to keep Cole Hamels out for the Phillies? What about Jordan Zimmermann, having nearly as good a season as Strasburg, or Madison Bumgarner? Will Matheny be able to overlook the fact that Kyle Lohse may be 10-2 in a few days? You know I don’t care about win/loss record or ERA, but I bet managers do. Beckett is helped by the fact that Jose Fernandez and is injured, and that Giancarlo Stanton is such an obvious choice that they won’t need to shoehorn another Marlin on. But with Matt Harvey hurt and David Wright having a subpar season — the latest balloting had him second to Aramis Ramirez — the Mets may need to get Bartolo Colon or Zack Wheeler or Jon Niese forced onto the squad, unless you really like Daniel Murphy. Obviously, there’s a lot that’s going to go into this, and it’s not all just about performance, based on how the roster shakes out. Maybe the regression we all fear is coming happens in his next start, and suddenly that ERA is 3.20 and doesn’t look as shiny and this isn’t a conversation. Honestly, whether he makes it or not isn’t the issue. It’s that we’re talking about it like it’s a very real thing that can happen. I think that alone tells you all you need to know about how unbelievable Beckett has been, to the point where I find his performance almost as surprising as Gordon’s. There’s not a lot of math involved in that, of course. I just wanted to use a fun new toy.